Eye exams are an important part of keeping yourself healthy. 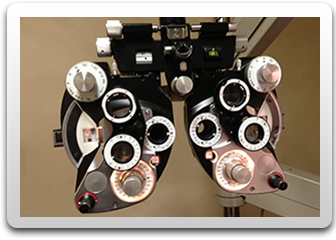 Our experienced optometrists go beyond simple vision screening to evaluate all aspects of your vision and eye health. Dr. Stoler and Dr. Russo provide comprehensive eye exams for every member of your family, at every stage of life. All adults should have regular eye exams. These exams help us monitor and address changes in your vision, as well as check for early signs of eye disease that can be detected only by a doctor. The American Optometric Association (AOA) recommends annual eye exams for adults who wear contact lenses or eyeglasses. Annual eye exams are also important for patients with diabetes, high blood pressure, or other disorders that can affect vision and eye health. After that, children without vision problems should have eye exams at least every two years. Children who wear eyeglasses or contact lenses should have eye exams annually or more frequently, if recommended by a doctor. Biomicroscope examination: The biomicroscope (also called a slit lamp) is an instrument that gives your optometrist a magnified view of your eye, allowing her to detect signs of disease or infection. Refraction: Your optometrist uses this test to determine your eyeglasses prescription. She'll ask you to look through various lenses and tell her which ones make the letters on the eye chart appear clearer. Your answers will help her identify the amount of farsightedness, nearsightedness, and/or astigmatism you have and prescribe the eyeglass lenses to correct your vision. Pupil dilation: Your optometrist may need to dilate one or both of your pupils to see the back of your eye better. Dilation is often used with patients who are at risk for eye disease because it enables the optometrist to do a more thorough evaluation. Tonometry: Tonometry is the medical term for several tests that measure the pressure inside your eye. If the internal pressure is high, it can damage the optic nerve at the back of the eye. This condition is known as glaucoma. Two common tonometry tests are the air puff test, where your optometrist evaluates your eye's response to a small puff of air released on the surface of your eye, and applanation tonometry, where your optometrist uses yellow dye and a slit-lamp attachment to manually measure your eye pressure. If you're ready to schedule your eye exam, call us today at 440-349-2225 for a convenient appointment.